The most common reason for visits to chiropractors is pain. Chiropractic has proven effective time and again for both acute (new) and chronic (long-term) pain, so you are in the right place. Our specific chiropractic adjustments are also extremely effective at removing stress from both the musculoskeletal system and the nervous system. It is actually this removal of stress that allows the body to heal much more quickly and efficiently than it would without adjustments. 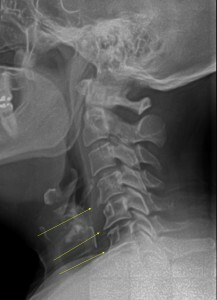 Car accidents are a common cause of neck and back pain. We have dealt with hundreds of auto accident victims over the years. Injuries sustained in car accidents are often more severe than they feel, and the long-term effects of auto accident injuries can be devastating, even if it doesn’t hurt now. It has been well established that impacts as slow as 5mph can result in neck injuries, resulting in tissue damage. If you have been in a car accident, please contact us to find out if your auto insurance will cover the cost of your examination and treatment, and get checked today. We can tell a lot from x-rays. A famous chiropractor once said “Adjusting a spine without seeing an x-ray is like a surgeon using a blindfold.” Using our digital x-ray technology, we can see areas of the spine that are damaged or injured. We can see exactly where your spine needs to be adjusted in most cases. Then we can create a plan suited to your individual needs. Your spine can begin the healing process, and your body can actually function better, longer, and more efficiently. Your nervous system runs your entire body. Along with digital x-rays, we can to check the function of your nervous system as it relates to your spine through our fast, painless, completely safe spinal scans. Injuries in the spine can irritate or pinch delicate nerves in both kids and adults, so understanding how your nervous system is functioning is just as important as getting rid of your pain. When we remove stress in the spine and nervous system, both your body and mind can run better, you will have less pain, and be healthier. Scans are especially helpful when dealing with very young kids or during pregnancy, when we don’t want to expose the body to x-rays. If you have a new or old injury in your spine that is giving you pain, your body needs help now. Allowing injuries to stay without help leads to decay and degeneration, and more pain later. Call us today at 801-762-6940 to schedule your low-cost consultation and examination as soon as possible.